Ismaele Gatti was born in Como (Italy) in 1998. 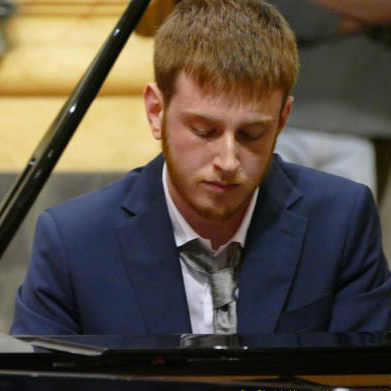 He started studying piano at the age of five and in 2016 he graduated in Como conservatory, under the guidance of Ugo Federico. In 2018 He also graduated in organ in the same conservatory, in Enrico Viccardi's organ class. In 2017 the Giosuè Carducci cultural association, based in Como, awarded him the "Franz and Maria Terraneo" prize, assigned to the best graduate in Como area in the 2015-2016 academic year. He is currently attending the Master in Organ Music Performance at the Conservatory of Lugano under the guidance of Stefano Molardi. He has performed as pianist and organist in several Italian and European locations, both as soloist and as member of chamber ensembles and orchestras. He performed the inaugural concerts following the restoration of the 16th century positive organ situated in the Paolo Giovio Museum in Como (2014) and of the Alchisio organ of the S. Sebastiano church in Caino di Vercana (2016). He has performed on several occasions as organist and continuist with the choral ensemble "Ad Libitum", based in Calolziocorte and directed by Daniela Garghentini, featuring a broad repertoire ranging from German Baroque (Schutz, Praetorius, Pachelbel, J.S. Bach) to late French romanticism (Gabriel Fauré). He received several awards in many piano, organ and chamber music competitions held in Italian and European venues. He has recorded CDs on the historical organs of Brenzio, Consiglio di Rumo (2011) and S. Maria in Campagna in Ponte in Valtellina (2015) for Torculus Records (Milan), as well as a CD of Christmas Renaissance music, "Por engañar el diablo" (Torculus Records - 2015), with the ensemble "La Chambre du Roy René". He is co-author of the book & CD "Organs - Art and Music in the historical churches of the Valle Intelvi" (Attilio Sampietro - 2013), on which he held several book launch conferences. He has attended several organ masterclasses with internationally renowned musicians such as Jean Claude Zehnder, Ludger Lohmann, Enrico Viccardi, Giancarlo Parodi, Stefano Molardi, Stefano Rattini and Andreas Liebig. He has recently collaborated with leading figures in Italian contemporary music scene, such as John Rutter, Massimo Mazza and Katia Ricciarelli.